Japanese fishermen have insisted they will continue hunting dolphins despite calls from animal protection groups. They claim they haven’t broken any rules and promise to pass their hunting traditions on to future generations. "We will never stop it," Yoshifumi Kai, from a fisherman's cooperative in the town of Taiji, southwestern Japan, told reporters at a press conference. Taiji has long been known for drive-hunting on whales and dolphins, which is a subject of controversy. Last week, Japan's zoos and aquariums voted to stop using dolphins caught by this method, meeting the demands of the World Association of Zoos and Aquariums (WAZA). Drive hunting is a method of catching dolphins by using boats to drive them together into a bay or onto a beach. 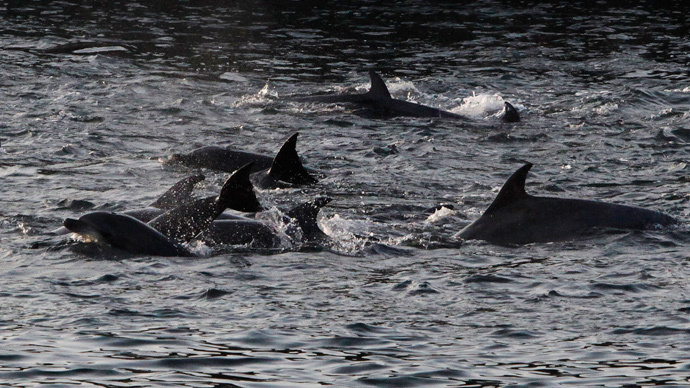 In Taiji this hunt takes place annually from September to March. Some of the dolphins are captured alive and are sold to aquariums. Each one costs around 1 million yen ($8,300). "We used to harpoon dolphins but that's several decades ago. Now we sever the spinal cord in a moment and there is not much blood," said Kai. The head of another local fisherman’s group in the town, Shuichi Matsumoto, said they "have not broken any rules." He also added that his fishermen’s group vows to continue dolphin hunting traditions and pass them on to future generations. The Japanese Association of Zoos and Aquariums (JAZA) is set to ban all its members from buying dolphins caught off Taiji. Taiji became famous after the release of a 2009 documentary film called The Cove, which concentrated on dolphin hunting practices in Japan. The film called for action to be taken against mass dolphin slaughter and for public information to be made available about mercury poisoning from dolphin meat. Over 20,000 dolphins are slaughtered in Japan every year, according to estimates from the Oceanic Preservation Society, a non-profit group that makes films, inspiring people to save the oceans. Environmental organizations have repeatedly staged protests against slaughtering dolphins and whales in Japan.